Hi there crafty peeps! 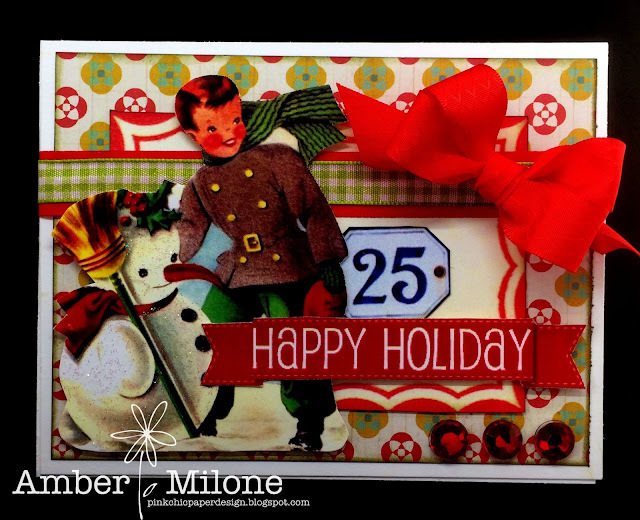 I am dropping by today to share a retro holiday card I created using some awesome ribbons from the Really Reasonable Ribbon store. I layered several papers and images from one of my hoarded creativity kits that I purchased from Pollys Paper on Etsy. I wrapped Poppy Red Diamond Satin ribbon and 3/8" Celery Green Plaid ribbon around the card base and topped it with a bow made from the same Poppy Red Diamond Satin ribbon. To finish the card, I added some crystal Stickles all over the snowman to make him sparkle and three red gemstones at the bottom of the card. I hope you enjoy this retro creation and don't forget to head over to the store for all of your holiday ribbon needs. Have a wonderful day!